Debbie Golt is passionate about music, especially reggae and African, and still DJs at festivals, clubs and on radio in her mid 60s, having started playing out in public at Rock Against Racism gigs in Manchester in 1978. She played a feisty 78/79 punk and reggae mix at the Love Manchester Music Hate Racism event celebrating the 40th Anniversary of the Northern Carnival against the Nazis at Night People in July. 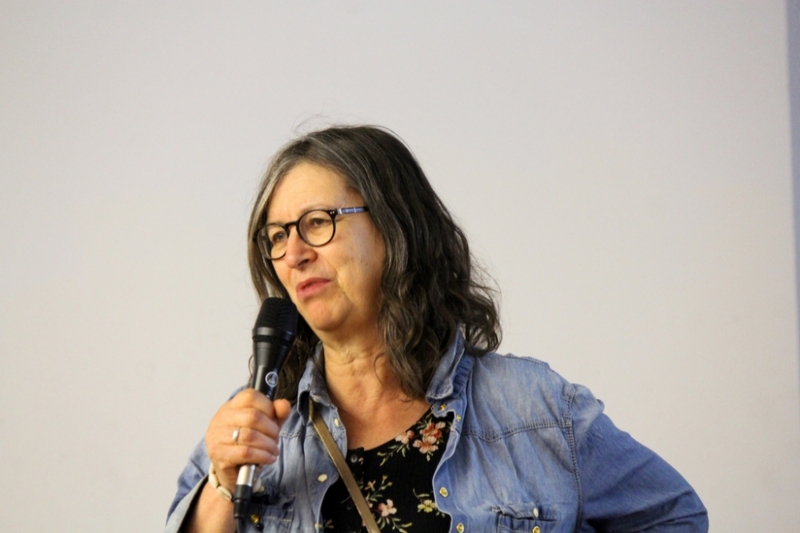 Now London-based, Debbie lived in Old Trafford in the late 70s and was immersed in RAR and related activities as well as being part of Socialist Workers Party. Debbie co-organised a great many events in different parts of Manchester and was a steward at the Northern Carnival against the Nazis. Later she worked to keep Manchester RAR going in 1979-80 after Bernie Wilcox left Manchester. Together with Maggie Ross Turner Debbie rescued the 1979 national Red Rhino tour when the major names pulled out at the last minute and over 200 tickets had been sold. Unable to get other big names to take part at short notice they called in other local artists to play alongside X-O-Dus who were still on board as the original local act: Badstone and the Distractions both stepped up as did Top Sound man President (Amin) and the event was rammed and very well mixed. Debbie built a great rapport with local black young people and organised a series of Youth Sound Systems with Manchester and Birmingham Youth Sounds at their request. Manchester Sounds were Baron, Killerwatt (and another whose name escapes her). Debbie wrote for Temporary Hoarding, most notably interviewing John Cooper Clarke (with Vicky Passant) for the Manchester edition of TH and a discussion piece after talking with members of Baron and Killerwatt Sounds. Debbie came to Manchester to work with agitprop group North West Spanner Theatre and then was a youth worker. After returning to London, she worked with African music and culture organisations, managed bands including Taxi Pata Pata and co-ran Half the Sky (with Alexa Dalby in early 90s), who championed African women artists, and gave Oumou Sangare her first UK dates, and were the first to interview Angelique Kidjo (with Nish Watengwa). She was a Local Authority Arts Officer and then moved on to be a Radio Skills trainer with Women’s Radio Group and is now with Community Champions. Debbie has been a radio broadcaster since the early 90s and was part of the first internet radio, Gaia Live in late 90s/early 2000s. Her current show The Outerglobe is on Resonance FM London and worldwide. She is also Chair of national organisation Women in Music (UK).